Keeping your car windows in tip-top shape has many advantages. The auto glass on the exterior of your car probably took a beating this summer with road trips, severe weather, and four-wheeling trips around Texas hill country, but what about the auto glass in your vehicle’s interior? If you’re like most people, the interior surfaces of windshield and windows are likely caked with fingerprints, dust, the remnants of dog licks, and whatever that stuff is your kid stuck on the back window. Because these common substances found on the surfaces of auto glass can impair your vision, we’d like to offer some cleaning tips for keeping your interior windows nice and clean. Please continue reading below to learn more. It’s sometimes easier to go for the least-expensive glass cleaner, especially when money’s tight. With a sea of auto glass cleaners available, there are a few things to keep in mind when choosing the perfect glass cleaner. Go with a glass cleaner that does not contain ammonia, alcohol, or any ingredient that may give off toxic fumes. Ammonia is a powerful cleaning agent that definitely has its moments; however, cleaning your car windows with ammonia can damage tint on your windows. Additionally, ammonia can dry out other of your car’s interior surfaces including plastic, rubber, leather, and vinyl. What’s more, ammonia gives off harsh fumes that may irritate your eyes and sinuses while cleaning your interior windows. When it comes to ammonia-based glass cleaner, just don’t. A good towel can make the difference between streaky windows with leftover lint or a perfectly clear, streak-free windshield. Not only are microfiber towels cost-effective in that they are reusable, they are durable, yet won’t scratch auto glass surfaces. They work great for cleaning both interior and exterior glass in your vehicle. Microfiber towels can clean everything from fingerprints to tough stuck-on debris that a paper towel simply won’t clean. Additionally, using microfiber towels is a great, eco-friendly option compared to using multiple paper towel sheets that will only leave trails of paper fibers on your auto glass. Opt instead for a good microfiber towel to clean the interior glass of your car. There’s nothing worse than getting the interior windshield of your car spot free only to mess up the freshly cleaned glass with stray spray sprinkles from a vinyl protectant spray. These oily cleaning products are great for shining up vinyl, plastic, and leather surfaces, but they make a huge mess on glass surfaces. 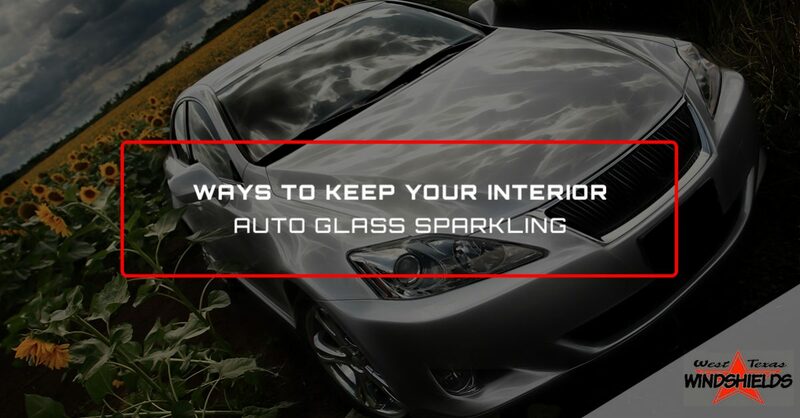 To avoid this issue, detail the rest of the car’s interior surfaces first, and save the glass cleaning for last. You remember Mr. Miyagi’s car cleaning advice for Danny Russo in The Karate Kid movie, right? He recommended waxing a car in a circular motion for the ultimate clean and shine, which is great advice for a car’s exterior surface. But for cleaning auto glass, it’s a different story. When cleaning the windows in your car’s interior, it’s better to clean across the glass in a back-and-forth motion, followed by an up-and-down motion. This will ensure that the entire surface gets cleaned and wiped down without leaving any streaks behind. Once you’re done with the spray, use the dry side of your microfiber towel to wipe across the surface to remove any remaining streaks or dust. While cleaning all of the windows in your car is a great way to improve 360-degree visibility, sometimes cleaning simply doesn’t cut it. For auto glass with chips, cracks, splintered cracks, or if the windows in your car have stopped rolling up or down, it’s time for a car window repair or windshield replacement. While this may seem like an added expense, repairing or replacing your auto glass will make it much easier to see what’s in front of you, and will make your vehicle much safer on the roads. And in most cases, your insurance may completely cover or partially cover a car window repair or replacement. For the best, most reliable windshield replacement and car window repair, contact West Texas Windshields, San Angelo’s Top Rated Local® auto glass experts, to schedule your appointment today. Our auto glass technicians will be happy to get the windows in your car in top working order to improve your visibility and safety while driving. Call us today!